From the very first lesson, students will be playing pieces they enjoy. As students progress, they can learn easy Christmas carols, 5-finger editions of most Disney songs such as from “The Lion King” (for the younger crowd) and pieces from the TV show “Glee”, for example (for the ‘tweens and teens). We excited to your kids private piano lessons in the Toronto area. The instructional books we use are highly recommended and contain familiar and creative pieces, finger exercises, sight reading, ear training and written work, presented in a fun and age-appropriate manner. Every level has a popular repertoire book. 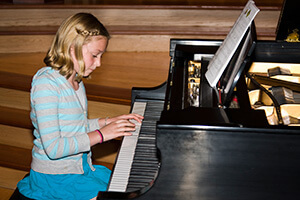 Improvisation is taught even to young beginners, developing their musical creativity. Parents are encouraged to attend lessons for the younger students as this facilitates home practicing. Parents of older students are also invited to attend lessons, if the student is comfortable with this. Interaction with parents is an important component of the piano teaching “team” so communication regarding any aspect of the student’s lessons or practice habits is encouraged. Royal Conservatory of Music graded approach is taught as students advance beyond the beginner levels. There is a great deal of appealing repertoire at increasing levels of difficulty, including popular music. We would be honored to be the guide for your child’s musical journey. Call about our kids private piano lessons today!